» Albany mayor: Down with weeds! Albany mayor: Down with weeds! Who’s supposed to take care of this wilderness between Seventh Avenue and the Union Pacific right of way? The trouble with springtime, as we all know, is weeds. And trying to keep weeds from growing is a battle that cannot be won. But the Albany mayor would like somebody at least to try where city streets are concerned. Mayor Sharon Konopa raised the subject at the end of the city council’s meeting Wednesday night. 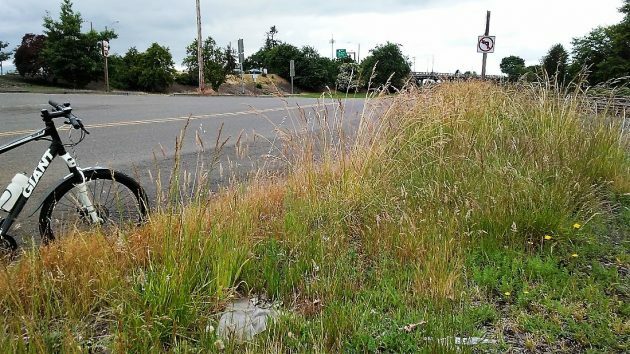 She’s worried that Albany will make a bad impression on visitors this summer because of weeds growing along the city’s major streets, especially but not only along the state highways such as Pacific and Santiam and coming off the freeway. She told the council she asked the staff what it would cost to give the city parks’ mowing contractor the added job of cutting weeds twice a year along some thoroughfares. The sum of $17,000 was mentioned as an estimate. Councilors said it would be worth asking businesses to take care of parking strips along the streets in front of their properties. If people are asked, Councilman Rich Kellum said, they might step up. Councilman Mike Sykes had another idea: Hire somebody to take care of the problem and send ODOT the bill. Even though it’s been cut, this island inside the Pacific-Ninth couplet still looks kind of splotchy. I smell another tax coming around the merry go round. That always seems to be the Council’s/Mayor’s solution. But now it’s a “fee” because all new taxes have to get approval from voters, and we know where that goes. Making our community look better is a worthy expenditure of our money. I am all for hiring more workers to beautify our roadways. LBJ’s wife Claudia made such projects her cause as First Lady. I hope Albany’s council is taking seriously weeds growing on unoccupied property — for beautification as well as fire safety. How timely is the process for getting landowners to cut weeds, etc.? How long does it take for the city to act when property owners let hazardous conditions endanger others? I am still in TOTAL agreement with Claudia!! (The previous comment). It is a valuable investment in Albany!! It’s been a long time coming. And the improvements going on in the downtown core area are going to make people more inclined to shop and eat etc. Which in turn help businesses thrive. The Mayor has some sort of prejudice where weed/weeds are concerned. She was worried that weed shops are the most prominent businesses one sees when one rolls into town, and now she’s concerned about noxious weeds that line the roadways, greeting visitors to our fair city. Perhaps it is time for CARA to expand it’s mission. Clean up the noxious weeds and loan the garish marijuana dealers some cash to spiff-up their storefronts. The mayor is right. You only get one chance to make a first impression and right now, thanks to grotesque weed growth and tacky-looking pot shops, Albany’s First Impression is rather unimpressive. The time to expand the CARA role in overseeing the image of Our Fair City has come. Cut down those weeds and spruce up those storefronts. A lot of folks will be in town for the Eclipse and we want to make the right impression. Hire a work crew. They do a great job and give back to the community. It would cost less. The benefits are many. You can’t just go killing weeds indiscriminately! Weed lives matter! Seriously though, why would you send the bill to ODOT? 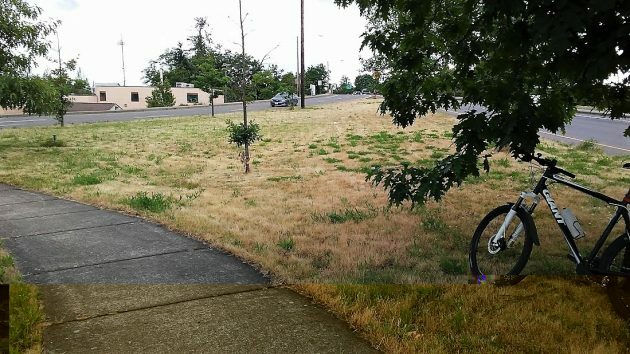 Other Oregon cities take care of their own weeds (or not) as they they wish. Why should they pay for Albany’s problem? Do you want to pay for Portland’s weed problem? Apparently the Mayor doesn’t pay much attention at council meetings. In December 2016 the city passed ordnance 7.84.120 which addresses tall grass and weeds and assigns responsibility for abatement of same. There is no section that relieves the city of responsibility for their property. According the “City Bridges” there is a Code Enforcement Officer, who is attached to the Police Department, that can be contacted and these properties reported to. Come on folks, clean up your weeds. CARA could double down on it’s Carousel Investment while whacking weeds simultaneously. Here’s how. Before the massive platter that supports the various carousel creatures is installed, carousel technicians should install wheels on the underside of the platter so as to allow the platter to move about freely. Then, these same crafty technicians ought to install a series of ultra-sharp, ultra-strong slashing blades to the outside rim of the carousel platter. These blades would have to be retractable for normal Carousel operations. However, when needed, the platter could be wheeled to weed-infested locales, the biting blades extended, the carousel spun into rotating beauty, mercilessly slashing the dastardly weeds in mere moments. Once the weeds are whacked, the carousel platter trundles back downtown where it resumes it’s regular duty of going nowhere slowly. I quote, “without repeated applications of massive amounts of weed-killing chemicals, this looks very much like an endless war”. We need a war on those stinking ‘weed-killing chemicals’ as they are killing everything – not just the weeds. Childhood and animal cancer numbers are through the roof. Why?! –> both play in the very grass that the city and others are all too quick to spray. Use distilled vinegar, it only kills the weed and doesn’t cause cancer!! Wake up, world! And when you do, look up in the sky, see what is going on, and help put a stop to the Weather Geo-Engineering. Hasso and the Mayor see weeds. I just took a tour on Google Street View of both highways from the railroad overpass to the freeway (photographed in August 2016) to refresh my unpleasant memories of bicycle riding there a couple years ago. What did I see (except for Waverly Park)? Thousands of parked cars and room for thousands more. Uninteresting buildings of every size, shape, and orientation that have no connection with each other or their surroundings. The usual clutter of ugly signs which, mercifully, don’t seem to include off-site billboards. Houses where people seem to live, probably worth much less than those further from the highway. Four miles of Anywheresville, USA. Put in some scraggly palmetto trees and it could be the ghastly 250-mile-long megalopolis of Central and South Florida from which I escaped many years ago. The overwhelming impression is that of a place where cars are the only way to get around – ever bigger ones in an arms race of safety-illusion. A place where children don’t seem safe without their parents. The big activity is the accumulation of evermore little-used junk. All-in-all, a place not worth caring about, very much unlike downtown. And people worry about the impression made by some weeds or a little splotchy grass? But apparently all the broken glass etc. leaves a good impression?